The Nats bullpen revamp continues – I’ve already profiled new relievers Shawn Kelley, Oliver Perez and Yusmerio Petit. Today, they added to that by trading away Yunel Escobar to the Angels in exchange for right handed relief pitcher Trevor Gott. 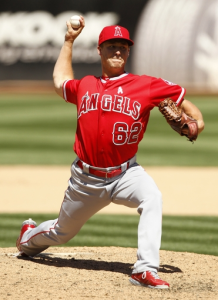 The Nats acquired Trevor Gott from the Angels, a 23 year old righty reliever. He was a closer at the University of Kentucky and was drafted in the 6th round by the Padres in 2013 before being traded to the Angels. 2015 was his rookie year, and he pitched well out of the bullpen, appearing in 48 games. He threw 47 1/3 innings, and compiled a 3.02 ERA, but his peripherals weren’t great. He walked 16 and struck out only 27. He dominated right-handed hitters – they only hit .214/.262/.286 off of him. Lefties did fare better, although 15 of his 27 strikeouts came against them. Despite the low number of strikeouts, he throws his fastball very hard, it sat between 96.5 and 97 mph last season. According to Brooks Baseball, his four seam fastball has heavy sink. He induces a ton of ground balls with it, and with his curve as well. His curve was hit pretty well towards the end of last season, so he relied more and more on his fastball. He also has a changeup that he barely used last season. Gott was strong in the minors, and that includes with strikeouts. In February 2015, Baseball Prospectus listed him as their #10 prospect in the Angels system. They listed his ability to induce grounders as a strength, as well as having the “brain and stomach for high-leverage situations”, but noted he might have trouble missing bats without developing his secondary stuff. He clearly still has some development ahead of him, but scouts, and no doubt the Nats, believe he has a setup man potential. If he can show a bit more strikeout ability, that 96+ mph fastball certainly suggests he could get there. The Nats also acquired a 28 year old RHP named Michael Brady. Brady has spent 6 seasons in the minors, most recently at AA. He is not on any prospect radars, and rightfully so considering the age and level. One thing the Nats might have found interesting, though, was his peripherals. In 385 1/3 IP in the minors, he has a K/BB ratio of 6.01. He strikes out about a batter an inning, but walks people at a rate of about a batter a game. If you’re in Harrisburg or Syracuse, he could be a fun guy to watch pitch, even if he’s not considered a prospect. I’ve argued for a while that Escobar should be traded, it just makes sense. He had a great year at the plate this season, and was a key contributor. But he was uncomfortable at second base, and his range limits him as a shortstop, so he was sort of confined to third base. It’s not a great position for him, because he’s got the bat of a middle infielder. It also forced Anthony Rendon to play second. Rendon was good at second, but he’s a better 3B, he’s got the bat for third, and playing him at 2B increased his already high injury risk. All that, combined with the fact that Escobar had one of his best years at the plate ever, was a poor hitter for the 3 seasons prior, and has a pretty team-friendly contract, made it almost a no-brainer that the Nats would look to trade him. The Nats were able to turn an extra infielder into a potential setup man, under team control for a half a decade, so this is a trade that could look very good, if Gott does what they hope he will do. The question now is, what happens with the Nats infield? The obvious first answer is the Rendon moves to third base. Dusty has already commented he doesn’t want guys playing “out of position” – one could imagine he was referring directly to Rendon. As for the middle infield, at this point it opens up those positions to Trea Turner and Danny Espinosa. They may go out and get someone to back up those two (Jimmy Rollins has been rumored), or even let Turner play understudy a bit if he’s not ready by April. One idea that makes sense to me is to put Espinosa at shortstop and Turner at 2B. This might take some of the early pressure off Turner to perform, allow him to relax a bit and focus more on hitting. Either way, with an infield of Rendon and Zimmerman at the corners, with the Danny and Trea show up the middle, it should be a very good defensive team, something they’ve certainly struggled with the last few seasons. Jayson Heyward would add another great defensive player in the OF!